Every time I look out my office window, I can see our urban native plant garden. Being able to look at the explosion of colorful blooms always makes me happy and if I’m having a particularly challenging day, it gives me a broader perspective. The phone call I’m having may be stressful, but I can glance over at the garden and see beauty. The cycle of plants and flowers continues and I love to see it all interact. The garden takes up a whole urban lot. It’s across the alley from our back parking lot. There used to be a small house there, which we used as a storage space for files until about 10 years ago when the building was razed and the lot sat empty. In 2014, I got the idea this would be a great site for a native plant garden as a contribution to Florida’s native beauty and environment-friendly life in the city. With so much overdevelopment in our city and state, having a lot full of native flowers, shrubs and trees seems like a nice juxtaposition. I also wanted a garden where I wouldn’t be using fertilizer or pesticides. That was one reason I wanted to explore native plants. Plus, I’ve read a lot about the devastation that invasive plants are causing around the state and witnessed some of it when cycling on the Van Fleet Trail in Polk County. To get started, I attended a joint meeting of the Florida Native Plant Society and Audubon Society. The speaker was talking about a project to plant wildflowers along state highways, which would save money because growing wildflowers is cheaper than mowing. I was introduced to Troy Springer of Springer Environmental in Plant City. His company motto is “Restoring Florida One Yard at a Time.” Troy designs and maintains native landscapes and his knowledge of Florida native plants is encyclopedic. He’s a true artist in how he uses native plants in landscape design. The first thing I needed for our urban native garden was an irrigation system. That wasn’t so easy! The city of Tampa utilities department couldn’t understand that I just needed an irrigation meter and not solid waste and sewer services. There was no building on the lot – we didn’t need sewer services! Two weeks of phone calls and talking with city engineers finally got it straightened out. Troy took soil samples and cleared the lot of invasive plants, including some Australian pines and chinaberry trees. We are fairly close to the bay and therefore more coastal. We planted slash pines, saw palmettos, yaupon holly and beautyberry. Beds were formed and planted with an abundance of flower seeds, which were covered with pine straw. This was in October 2014, and then we sat back and waited. By February or March, there was an explosion of color with blanket flowers, purple love grass, dotted horsemint and liatris. The bees love them. We seem to have hundreds of bees in the garden, which is healthy for the environment and another reason to have a native plant garden. Recently, Troy and I met to talk about the garden. The warm winter weather is causing a second flush of blooms from the blanket flowers. This could be potentially troubling but we don’t know yet how it will play out or how warmer weather could be altering natural plant cycles. Troy’s crew worked to winterize the garden and part of that was distributing seeds from the liatris plants among the flowerbeds. Liatris plants are quite striking when in bloom. They look like tall stalks of purple flowers. The birds were very excited about all the seeds! I love our native plant garden and hope that others in the neighborhood also are enjoying it. I also hope that it will inspire other gardeners to plant more Florida natives. To learn more – and there is a lot to learn! – I’ve found these two books are helpful: Florida’s Best Native Landscape Plants: 200 Readily Available Species for Homeowners and Professionals by Gil Nelson (University Press of Florida) and Native Florida Plants – Low Maintenance Landscaping and Gardening by Robert G. Haehle and Joan Brookwell (Taylor Trade Publishing). 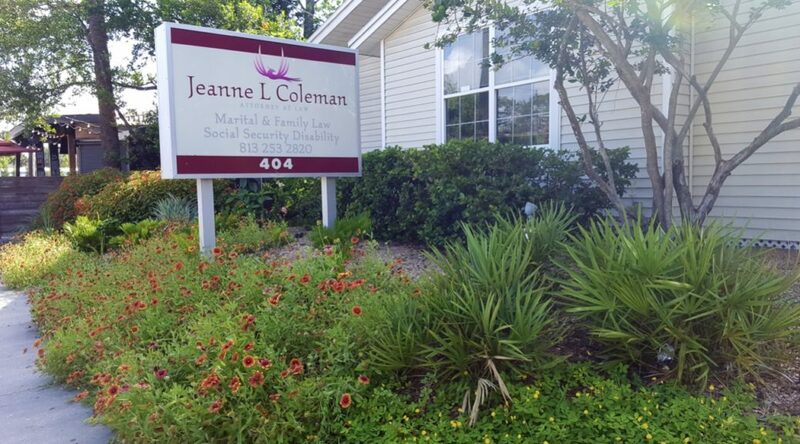 The law office of Jeanne Coleman specializes in family law and Social Security disability law.